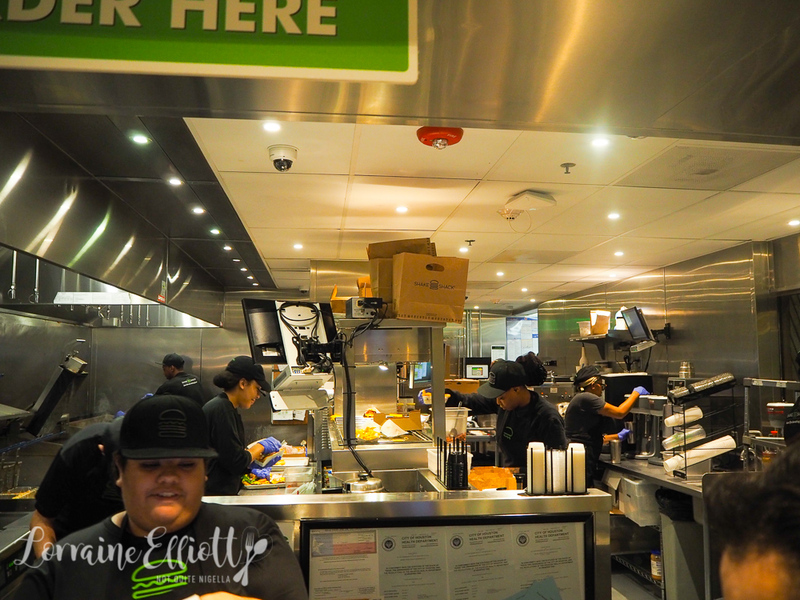 Sometimes food dreams can be humble ones and when I really recently visited Houston, Texas I was eager to tick off one bucket list item. 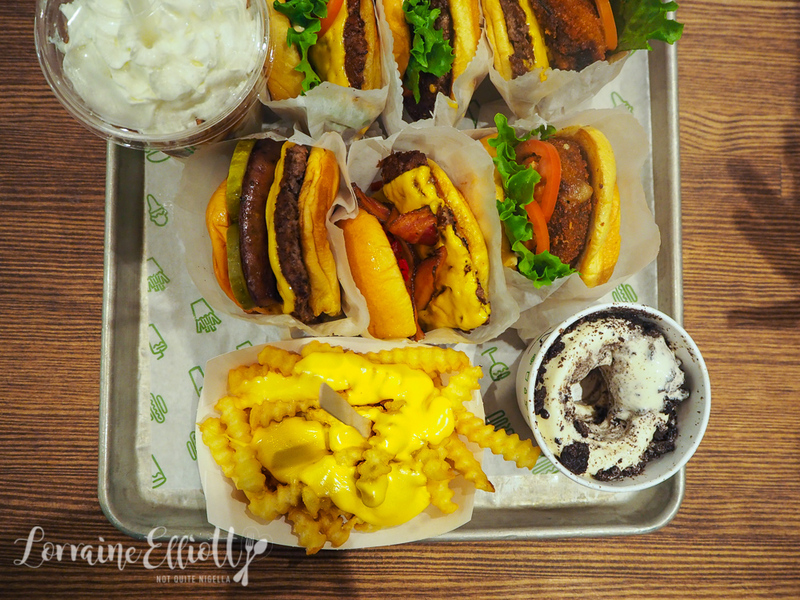 I had a hankering and lust to try the burgers at Shake Shack. 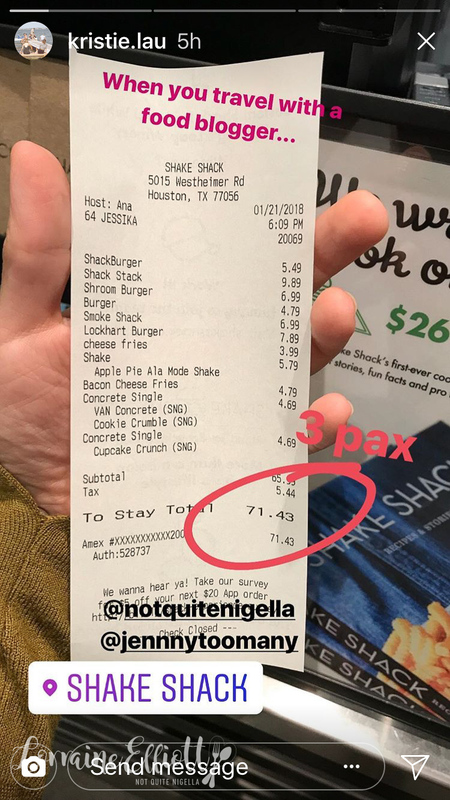 The East Coast burger chain has directly taken on In-N-Out from the West Coast and people are very opinionated about who does the better burger so I wanted to try it for myself. 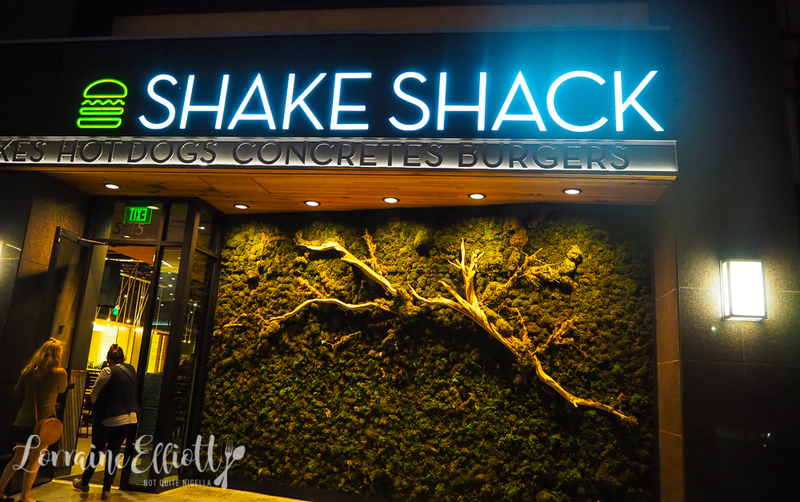 So there we were: one food blogger and three food enthusiast pals ready to take on a pre-steak meal at Shake Shack. We nicknamed ourselves "Grease Kweens". 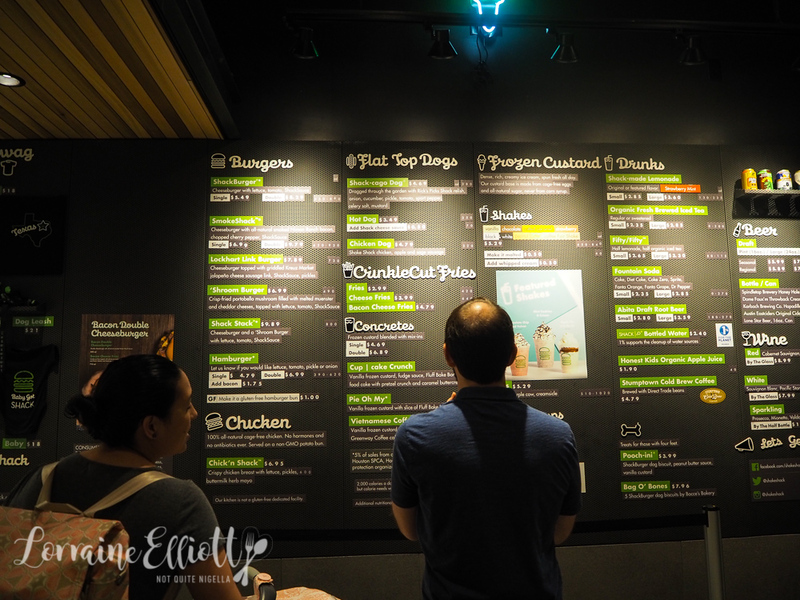 When we walk into Shake Shack I am struck by the breadth of the menu. I didn't know what to expect but I know I definitely did did not expect such a large menu. 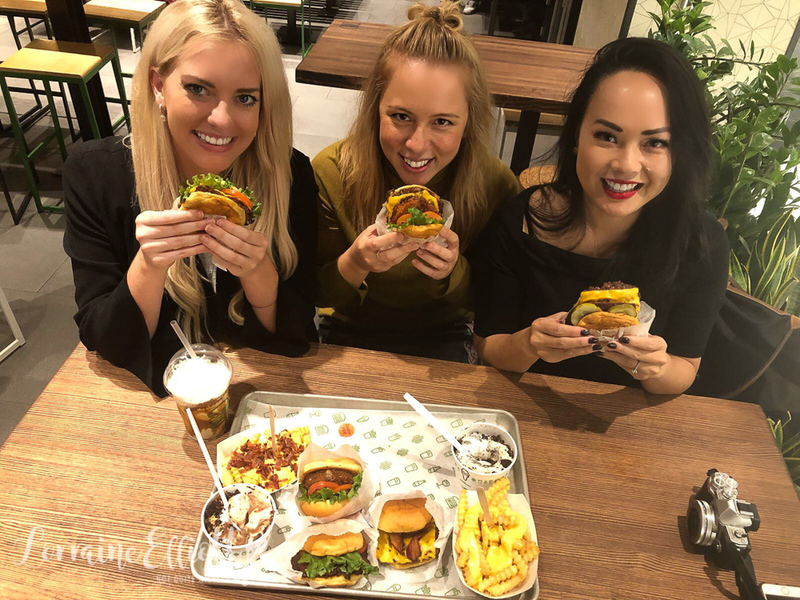 There are six beef burgers on offer including one very special Texas burger, one chicken burger as well as three types of fries, three hot dogs and lots of drinks. That's just the food. Also on the menu there is sparkling, red and white wine, beer, fountain sodas, floats, lemonade and juices as well as a range of desserts called concretes, frozen custards and treats for dogs! 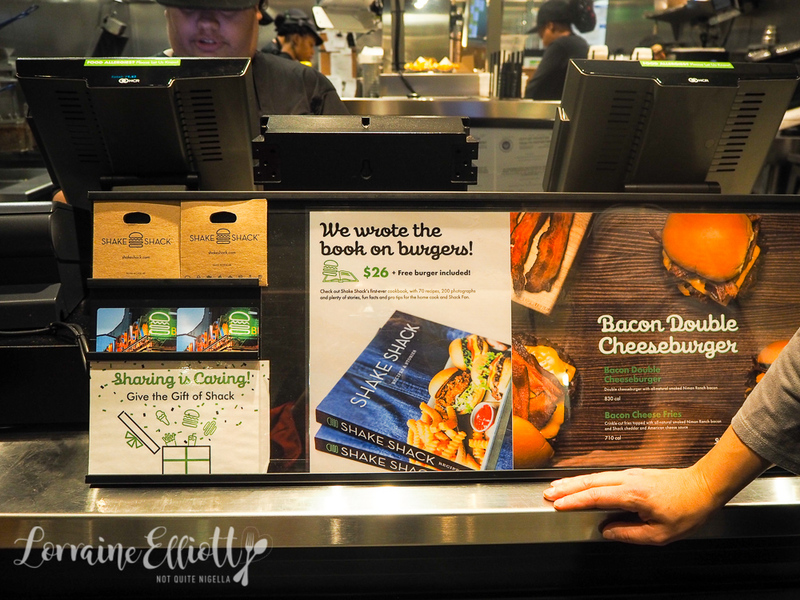 And at the counter there's even their own range of chocolate bars and a Shake Shack book. You can also get a gluten free bun for your burger. 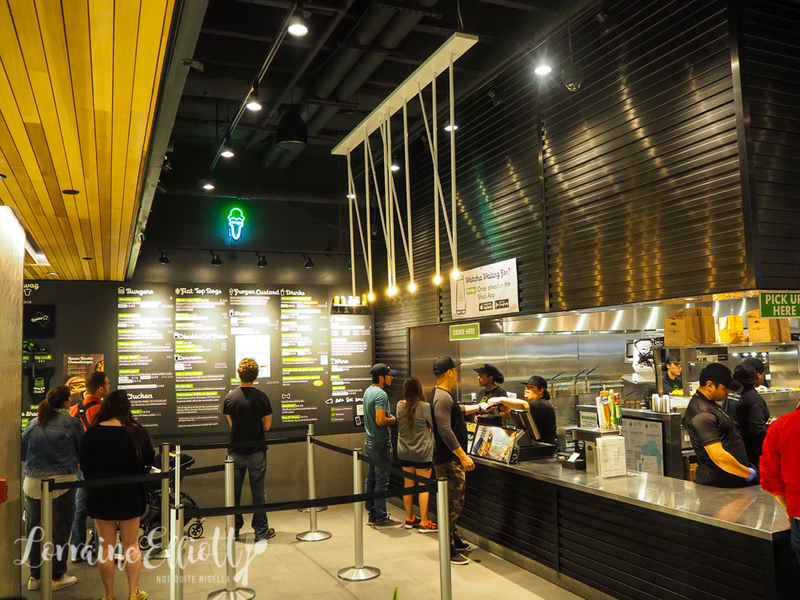 And the styling inside is quite dark, a contrast from most flourescently lit fast food places. "How many are we going to get?" I ask Jessika, Kristie and Jenna. We decide after about one second of thought to try all of them because why not. I mean we are only in America once a year and considering that we are murmuring about dreams coming true and jumping up and down excitedly, now is not the time to exercise great restraint. Something about that phrase go hard or go home resonates with us. And there is a slightly disturbing but enlightening number next to each menu item - the amount of calories! I notice something about Texans when it comes to service. 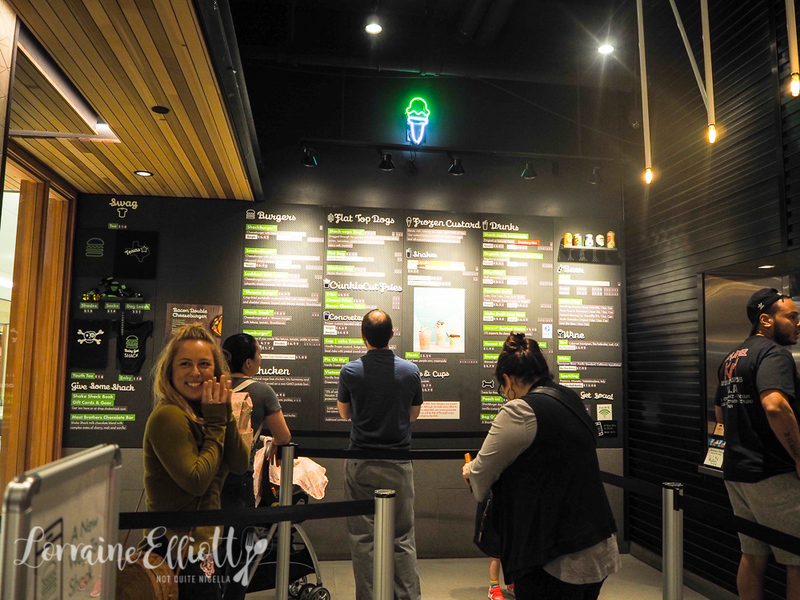 Even though it looks like we are quite possibly the ditziest, giddiest and most excitable people ever to step foot into a Shake Shack, the woman behind the counter is just lovely and patient and gives all the options and never rushes us giving us the full experience. We get the bill total and it's just over $70USD because I just kept adding to the order as I keep seeing things. Apple pie shake? Yes please! Concrete? Yes please!! We take our buzzer number and take a seat at the standing high table eagerly anticipating our order. "It's like we're getting a new puppy" says Jenna excitedly and we cry tears of happiness. By now we're making a small scene of mass excitement but people around us are very good natured about it. The sound of the buzzer goes off about 10 minutes later and Kristie goes to collect the metal tray. 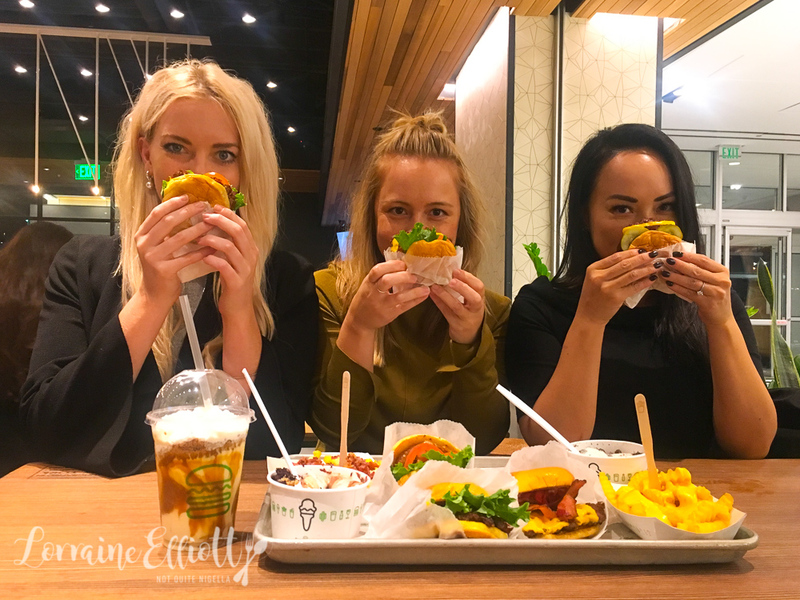 Jessika does a quick count-we're missing one burger but we can't figure out which one it is! She returns to the counter and retrieves our missing burger. What I noticed first of all is that the burgers are actually quite small. 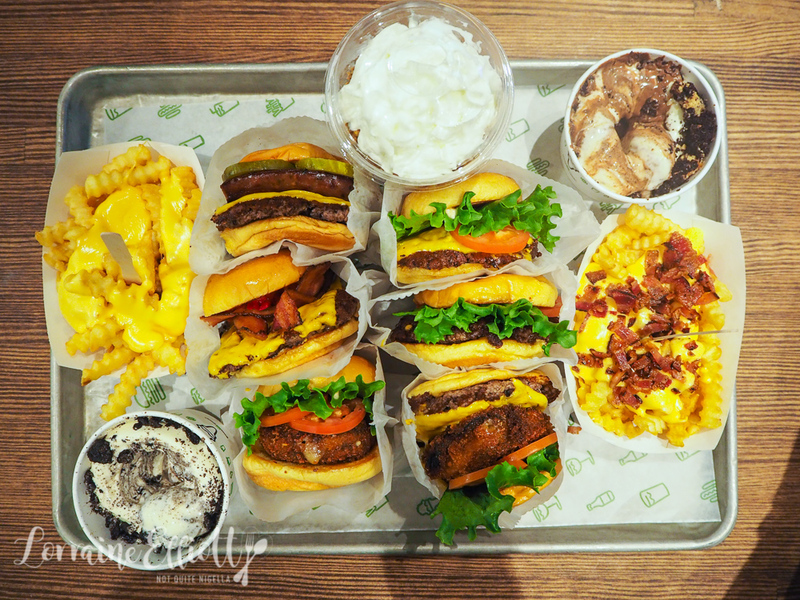 In fact they're much smaller than I anticipated considering how big everything has been in Texas although as I mentioned Shake Shack is not a Texan chain, it originated from Madison Park, New York. The main Texan burger chain is called Whataburger and Texans love Whataburger. We start with a hamburger, their basic burger where you have to request the lettuce, tomato, pickle or onion. I'm assuming this is for super plain eaters or kids. It also makes me a bit sad because I know the rainbow of possibilities out there and it's beautiful. 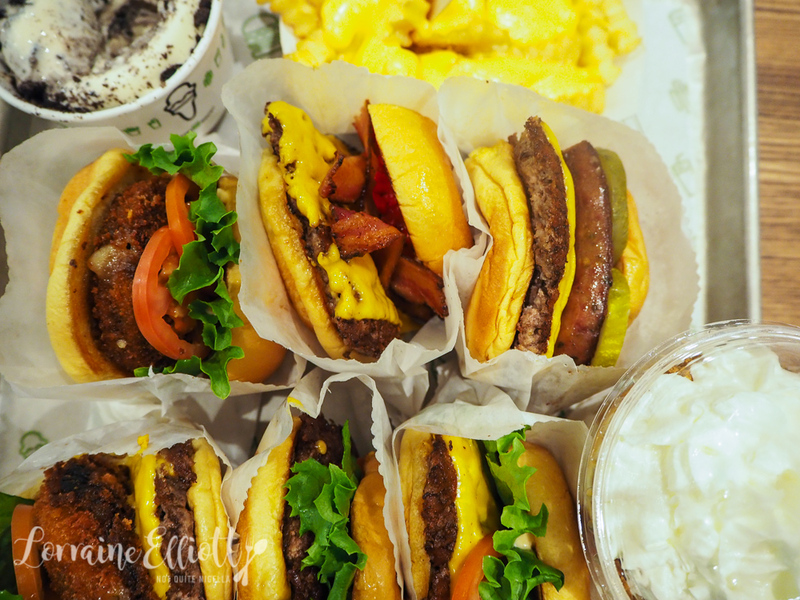 All burgers are available in single or double patties. Then we progress to the Shackburger, their cheeseburger. The hamburger is good with the super soft milk bun and a 100% Angus beef patty, cheese, lettuce, tomato and "ShakeSauce" but this is another starter burger for me. At $5.49 it's not as cheap as other chains. The ShakeSauce is reportedly a mix of mayonnaise, ketchup, mustard, dill pickles, garlic powder, paprika and cayenne pepper. The next one I try is probably my favourite of the lot and it is perhaps because of sentimental reasons. The Lockhart burger has split link of griddled Kreuz Market jalapeño cheese sausage link from Lockhart, Texas a town I visited a few years ago just to eat barbecue. 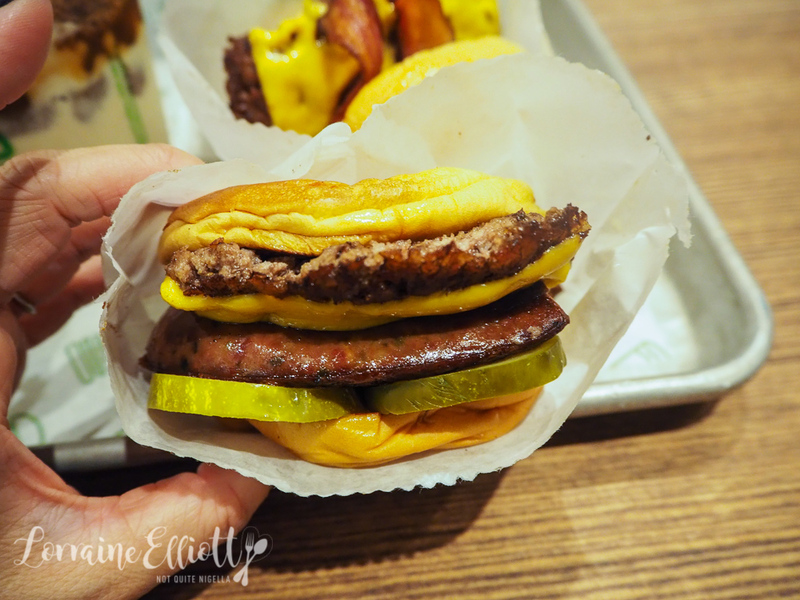 It's a beef patty with that grilled sausage links split in half with pickles and ShackSauce and it's just full of flavour. In fact it's the most flavoursome of the lot because the sausage is so good and it's exclusive to the Texas branches. Another favourite is the SmokeShack at $6.99USD. It's a beef patty with Niman Ranch bacon and chopped red cherry peppers (that aren't particularly hot) as well as cheese, tomato, lettuce and sauce. We try the 'Shroom burger ($6.99USD) which is a deep fried, crumbed portobello mushroom with Muenster and Cheddar cheese, lettuce, tomato and ShakeSauce and this isn't bad and they've really tried to add flavour with the two types of cheese. Then comes the Shake Stack burger at $9.89USD which has a beef patty as well as the crumbed fried mushrooms as well as all the toppings. It's comprehensive but you can still bite through the whole thing which is perhaps behind the logic of the small burger. I quite like this but then again I am all about the tasty sausage in the Lockhart Burger. Next stop: fries. These are crinkle cut fries and we went with a recommendation from a friendly fellow customer that the plain chips were not worth buying so we got an order of the cheese fries ($3.99USD) with liquid cheese sauce as well as the cheese and bacon fries ($4.79USD) with bacon and cheese sauce. You can probably guess which one was more popular. Bacon and cheese wins every time but you know the cheese fries themselves are also pretty good and I think I would've like this with some additional pickled red chilies on top. 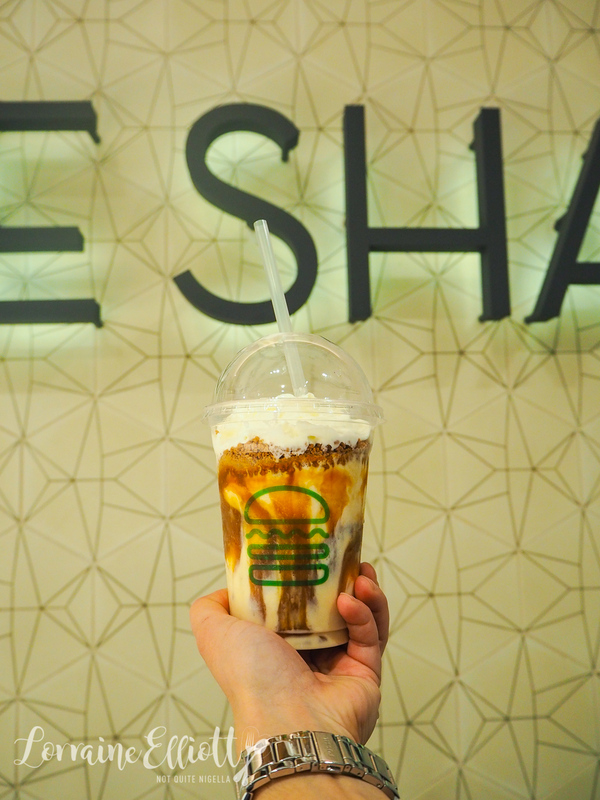 My last thing to try is the Apple Pie a la Mode shake ($5.79USD) and it is actually one of the highlights for me along with the burgers. With a real Apple Pie flavour to it and a layer of crumbs like a pie crust it's just the right texture. 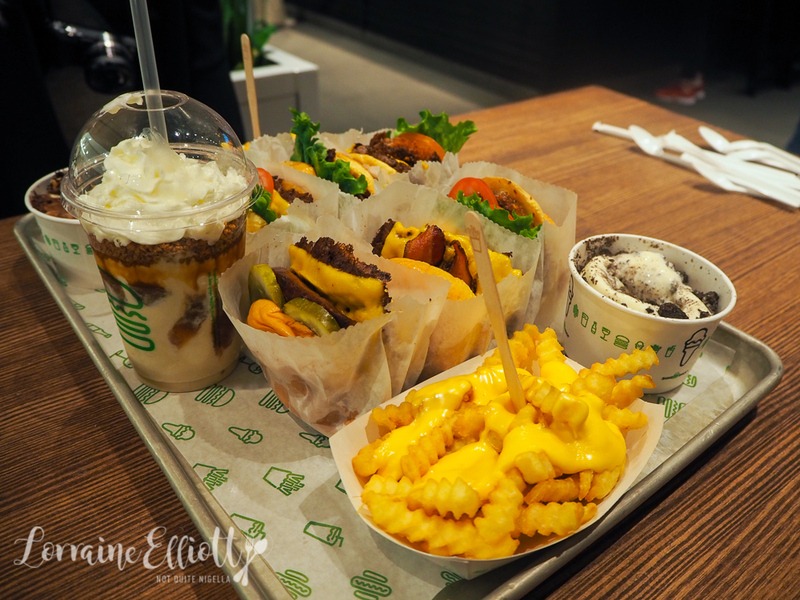 We have to comment that everything including the Apple pie shake burger and fries it's like America on a tray. And that's another item ticked off the bucket list! So tell me Dear Reader, what food items do you have on your bucket list? 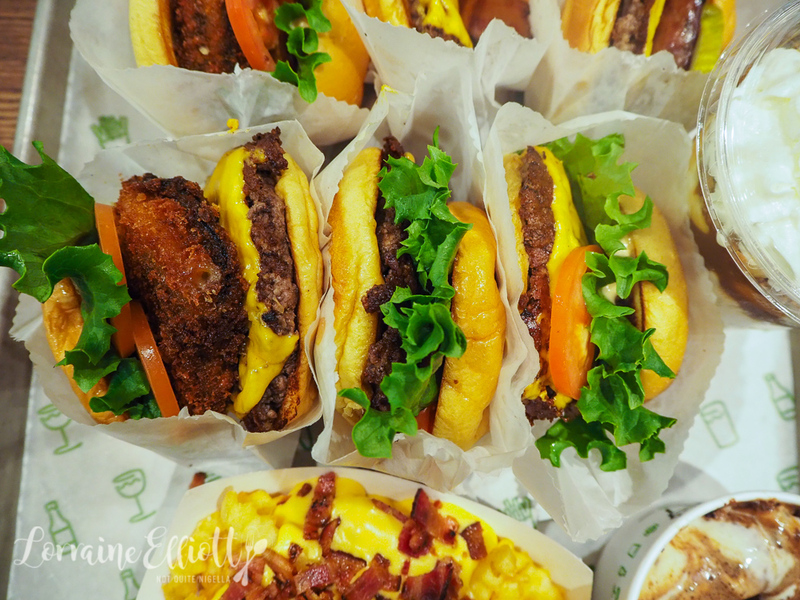 Have you ever tried Shake Shack? 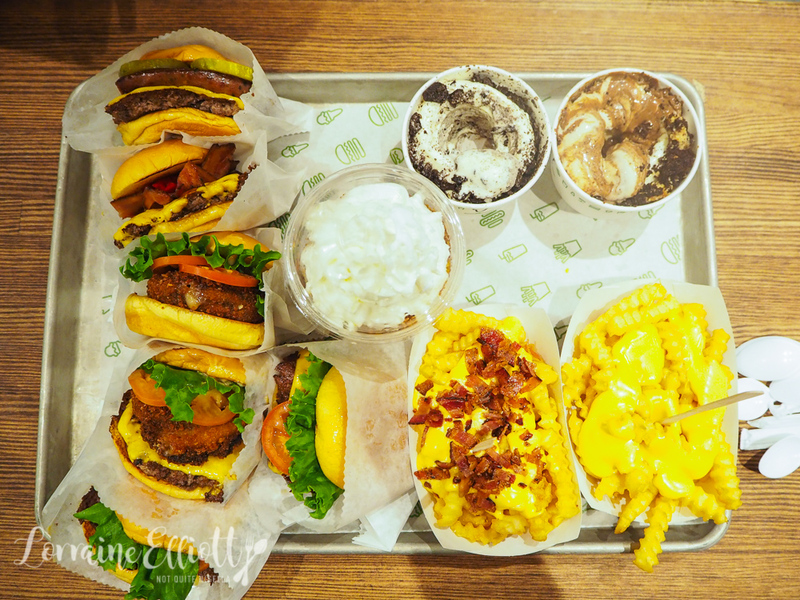 Which place does the best burgers in your opinion?